Tessa'a show ring career has been stellar! 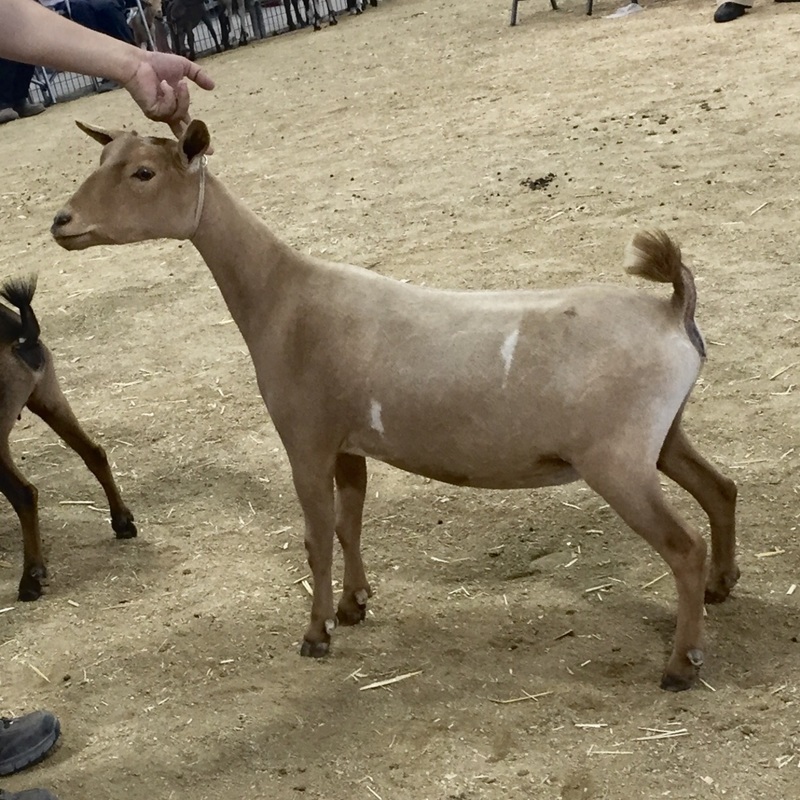 In June of 2016, at 15 months old we took Tessa to the very competitive Lost Valley Dairy Goat Show in Chino, CA and she won her dry yearling class in all three rings. Under Judge Dustin Noble Tessa she took Reserve Jr Doe. 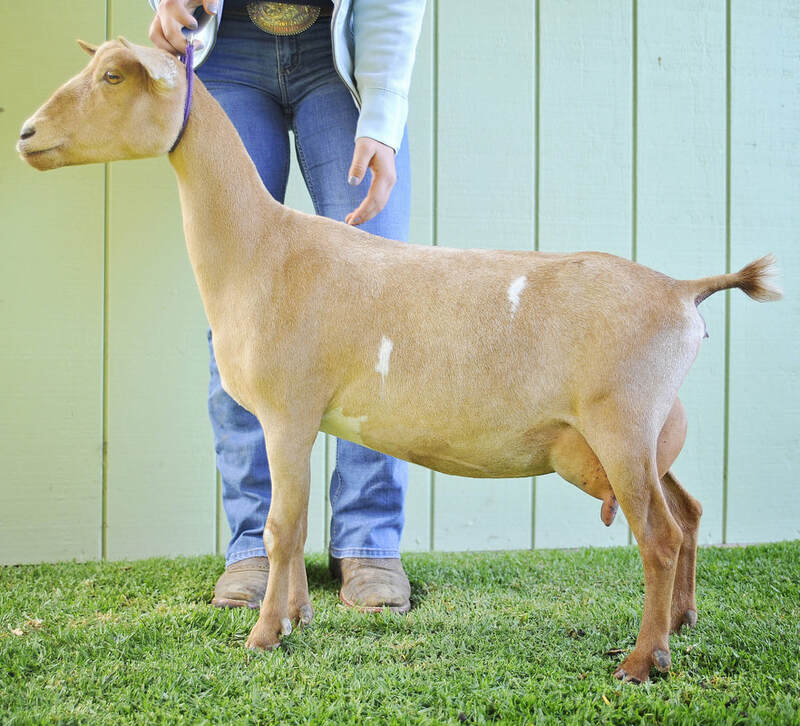 A few months later in August she earned her dry leg under Judge Elizabeth Henning at the Antelope Valley Fair against 40 Junior does entered that day! Then in the first 5 rings of 2017 as a two-year old first freshener, she placed first in every class and secured three Reserve Champion wins in Big Classes against some very nice senior does. placement, great foreudder extension, and a strong medial. Tessa's granddam Algedi ​ Farm Moonlace is dairy and elegant with incredible length of body. She has strong rear and lateral ​attachments that hold her capacious udder high and tight to her body. 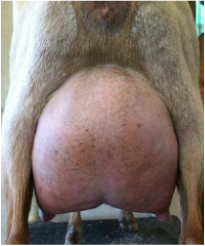 Lace also has a strong udder arch. Looking at her in profile she gives a gorgeous side view of her udder with perfect thirds in front and back of her rear leg. Tessa freshened for the first time as a two year old. As you can see from the picture above, we have no complaints on her FF udder. At her first milk test she gave 4.7 pounds of milk at just 35 days fresh...did we mention she's a first freshener?!? We love how high and wide her udder is. It is very capacious and she has plenty of room to carry it. 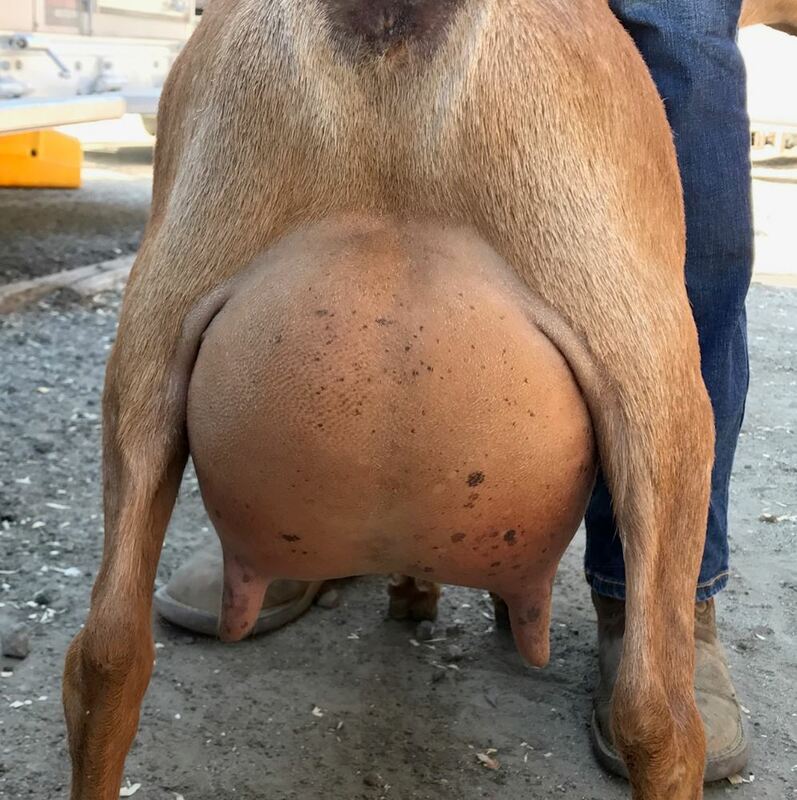 She has nicely developed side udder attachments and this leads us to believe her udder will hold up for a very long time. we love her medial and we look forward to seeing it improve even more with an additional freshening. Tessa has unofficially earned her AR Milk Star as a first freshener! Quads for Tessa this year! Incredible delivery of sextuplets. All over 2 pounds, all healthy, all thriving! ​at 60 days fresh. Tessa has unofficially earned her AR Milk Star in volume, fat and protein as a first freshener! Tessa was having a difficult time recouping from delivering sextuplets, we decided it would be in her best interest to dry her up and give her the year off. Look for her again in 2019!